Professional attire in an interview conveys respect for a potential employer and signals that you understand how to dress in a professional work environment. From high-profile consulting firms to trendy clothing companies, elementary schools to biotech labs—every work environment has its own unique expectations. By looking the part, you can show your employer that you’re a good fit for the position. 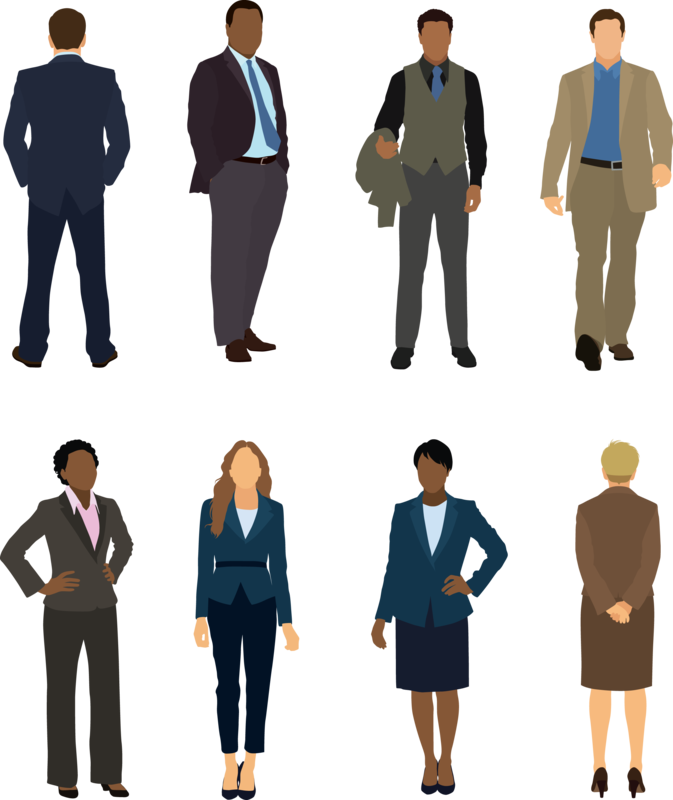 Although there is no one-size-fits-all approach to dressing professionally, this guide outlines some of the basic rules to follow. If you have any questions or concerns about appropriate dress for a particular interview or situation, be sure to schedule a meeting with your career advisor. Suits: Choose a pant or skirt suit in black, gray, navy blue or other subdued neutral tones. You will get the most wear out of a classic look that complements your body type. Be sure it’s dry cleaned and pressed between heavy wearings and tailored to fit your body. Shirts/Ties: Under your suit jacket wear a collared, ironed dress shirt or a conservatively-styled blouse in a color that complements your suit. Colors like white, light blue and cream are the most versatile for pairing with your other garments. Save the extra buttons in case you lose one. Ties are considered an essential part of business professional attire. Choose ties in solid colors or subdued patterns that complement the color of your shirt. Leg-wear/Socks: Socks should be a matching pair in a color one shade darker than your suit. If you choose to wear a skirt, pair it with stockings or tights, even in warm weather. They should complement either your skin color or the suit. Coats: Consider investing in an all-weather 3/4- or full-length wool coat for use in autumn and winter. A tan or black trench coat might be useful for mild or rainy days in spring and summer. Shoes: Choose black or brown leather dress shoes or a classic pair of pumps or flats in black, brown, navy blue or taupe. Avoid extreme styles, i.e. excessively pointed or square-toed shoes, or shoes with unusually thick soles or high heels. Shoes should be polished and in good repair, and comfortable, in case you have to walk a long distance. Do not wear brown shoes with a black suit. Belts: If your slacks or skirt have belt loops, you must wear a belt. Your belt should be leather and should coordinate with your shoes. Cloth belts should not be worn with suits. Accessories: For a first interview or an event that calls for Business Professional, the most important thing to remember is less is more. Jewelry: Keep it simple. Avoid extremes of style. No more than two rings per hand. No ankle bracelets, and keep to one piercing per ear. Avoid wearing any other piercings during the interview as they may be distracting. Bags: Choose a small and simple purse that has structure. Choose a color that coordinates with your ensemble. Leather and finely woven fabrics are the best, while canvas and straw are inappropriate for business. Briefcase or Portfolio: A leather briefcase or portfolio can be used for interviews and can carry a pen, notepaper, and copies of your resume. Always bring one nice pen—you’ll look prepared! Slacks or Skirts: Wool gabardine, chino, or corduroy slacks. Skirts should fall to the knee while standing. Despite being slightly more casual, slacks and skirts must still be crisp and wrinkle-free. Shirts: Collared shirts in solid colors or tasteful patterns are ok. You may keep the collar open under a sports coat, blazer, or sweater, and a tie is not necessary. Blouses can be more colorful but should still be cut conservatively. Sports Coats or Blazers: In some cases, you may want to wear a seasonally appropriate sports coat or blazer. A blazer or sports coat can be a part of your outfit or worn in lieu of an overcoat. Consider corduroy, cashmere, cotton, linen, or wool gabardine fabric. Sweaters: A nice crew or v-neck sweater in good condition can complement your collared shirt, and a cardigan goes neatly with a blouse. Be sure there are no loose threads and that it’s not pilling. You can take it to a dry cleaner to have it de-pilled. Shoes: You can follow the rules for business professional above. However, you might also choose coordinating flats or loafers that match your ensemble. Accessories: For a first interview or an event that calls for Business Casual, still keep it simple, but feel free to pick accessories that show your personality. Jewelry: Again, less is more. Still, avoid wearing ankle bracelets or any other piercings than one per ear, but feel free to pick jewelry that coordinates with your clothes or that may be more stylish. Bags: Same as with Business Professional, choose a small and simple purse that has structure and in a color that coordinates with your ensemble. Keep to leather or finely woven fabric. Briefcase or Portfolio: It may not be needed, but stick to the rules above. Keep your hair clean, neat, and out of your face. Headscarves are appropriate in understated patterns or tones that match the rest of your ensemble. Nails should be groomed, neat, and clean. Avoid long uncut nails or bright nail polish. The clean-shaven look is always a winner. If you have facial hair, be sure it is properly trimmed and clean. Keep makeup simple and natural looking. If you wear perfume or cologne, use sparingly or not at all. Taking good care of your suits and interview outfits will keep them looking good and lasting long. A well-taken-care-of suit will look sharp beyond the interviews and into your new job! Dry Cleaning: Have your suits, blazers, sports coats, skirts, slacks, and sweaters dry cleaned regularly. They can be pressed professionally, or carefully steamed at home. Alterations: Find a local tailor to handle any alterations to your clothing. Most suits will almost surely need some adjustment to look their best on you. Many stores will include tailoring with the purchase of professional clothing, so take advantage of this offer! Shoe Polish: Polish your shoes regularly to keep them looking new. Polishing your shoes also makes them last longer! The list below includes items that should never be worn for an interview. They are neither professional nor smart!